This four family to single family conversion is an absolute show-stopper! Great design and attention to detail converge to make this home truly one of a kind! Enter into the expansive living room and notice the engineered hardwoods that run throughout the home and the half wall and columns, accenting the dining room. The kitchen is stunning with granite counters, subway-tile backsplash, and modern stainless appliances. A center island is great for food prep or informal dining. Adding to the appeal of the kitchen is a breakfast room and walk-in pantry. A large bedroom and full bath are perfect for a home business or could be used for a main floor bedroom suite. Rounding out the first floor is a convenient half bath. Upstairs the master suite leaves nothing to be desired with a sitting area, large closet, and beautiful bath with custom shower! Don't miss the two additional bedrooms, each with their own private bath and the 2nd floor laundry! 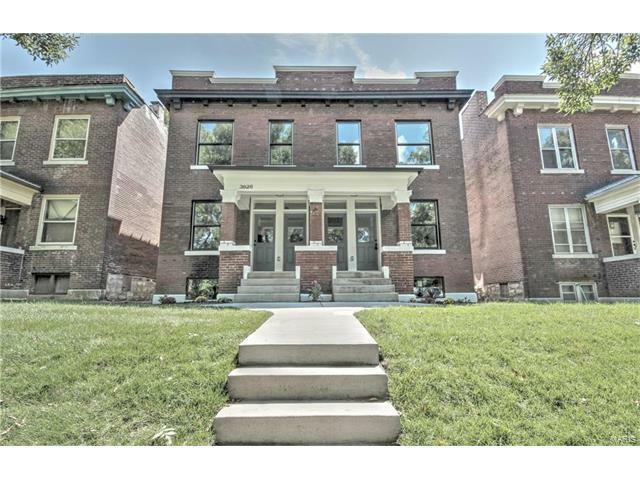 Close to Tower Grove and the Botanical Garden! From the West: 44 to Vandeventer, go straight on De Tonty for 4.5 blocks and home will be on your right. From the East: 44 to Lafayette Avenue, continue on Lafayette until Left on 39th and Right on De Tonty. Home will be on your left.